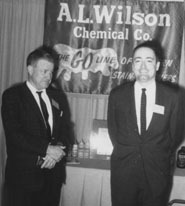 The A. L. Wilson Chemical Co. has been manufacturing stain removers of unsurpassed quality for over seventy-five years. From the beginning Wilson spotters have been great tools for drycleaners and launderers who accept the challenge to deliver the quality garments and linens that their customers are looking for. Wilson Stain Removers allow them to remove more stains completely and safely. In 1928, when Wilson Chemical was founded, the art of stain removal was in its infancy. Spotters were like amateur chemists, using their own secret potions to remove whatever stains they could. Some formulas worked, others failed. Results were spotty! In that year, Aura L. Wilson, a successful spotter, decided to bottle a few of his effective formulas and sell them to friends in the industry. It was a revolutionary idea. No one was offering packaged stain removers that used simple instructions and gave consistent results. Still, Wilson met with only limited success. Two years later, John Schwarzmann, who had recently sold his successful food distributorship, saw the potential in Wilson's idea and joined the company as a partner. He realized that there was a market for packaged stain removers well beyond Wilson's circle of friends. With his broad business experience and marketing skills, he set out to gain universal acceptance for the concept. In 1933, Schwarzmann purchased Wilson's interest in the business and launched the company on its current path. His philosophy was simple: Wilson products must be not only the most effective at removing stains but also the safest for delicate fabrics and colors. It's a business philosophy that has endured for three generations. With distribution in his background, Schwarzmann recognized the value a knowledgeable distributor could add to a product line, so agreements were struck with laundry and drycleaning distributors across the country. Several of the original distributors are still proudly selling Wilson Stain Removers today. 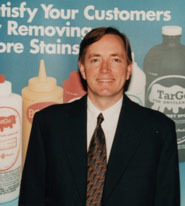 In time the high-value packaged stain remover concept was widely accepted and the company prospered and grew. 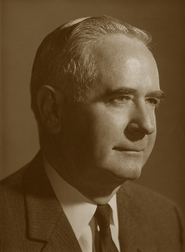 In 1950 John's son Frederick joined the company and upon his father's death in 1965 he became president. Under his leadership, the company continued to experience steady sales growth. In a major initiative, Frederick oversaw Wilson’s expansion into overseas markets. Today Wilson Stain Removers are found in laundries and drycleaners throughout the world. In order to maintain the manufacturing philosophy established by John, the company has invested extensively in research and development. These efforts have resulted in many new products that not only provide the high level of performance which the market demands but also address the environmental concerns that have surfaced in recent years. Without compromising effectiveness, our newly developed products are designed to be safer for workers and the environment. "Our manufacturing philosophy has not changed in over 75 years. We continue to manufacture high performance stain removers that contribute to the success of the cleaners and launderers who use them. We supply valuable tools that let our customers deliver the quality stain removal that their customers desire. Our customers know they can count on Wilson spotters to help them earn a spotless reputation and keep their customers coming back."